The session has set a goal to provide a wider range of pastoral care for our congregation. Some churches have a board of deacons to assist the pastor in this important function. At Trinity, we have decided to create a group of lay ministers who can play this role. Jane Ruffin and Jill Slade have been working since last spring to organize this ministry; the plan is to have it up and running in January. Our goal for November is to recruit care givers from our congregation. The care giver will be asked to commit to this ministry for a minimum of a year. Lay care givers will be matched with a person Craig believes to be in need of pastoral care and who is open to this type of ministry. The care giver will visit the care receiver in his home every other week. In addition, there will be monthly meetings with Jane and Jill. These meetings will provide support and training to the care givers as we share the experiences of our ministry. The care we hope to provide will be spiritual, social and emotional. The lay care giver will bring the love of God and of our Trinity community to the care receiver. Please think and pray over this opportunity to minister to our church family. We all are called to be care givers; this is a powerful way to answer that call. Talk to Jane, Jill, or Craig if you have questions. Trinity has long been a supporter of Denton Community Food Center. 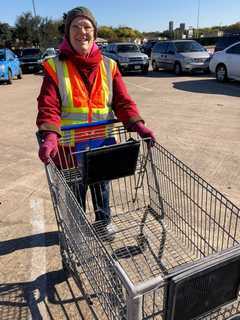 Every day of operation, DCFC gives away 2,000-3,000 pounds of groceries to those in Denton County who find they are struggling to put food on the table. Last year, Trinity contributed 1,380 lbs of food to DCFC. The Food Center is an affiliate of Tarrant Area Food Bank, and can make the most of cash donations. Last year, Trinity budgeted $700 for DCFC that it was able to leverage into 6 to 7 times that amount by purchasing through TAFB. So far, in 2018 (through October), Trinity members have contributed $4,668.19 to the Denton Community Food Center. In 2018, Trinity increased its contribution to DCFC through the Souper Bowl of Caring to$732.37, up from $679.43 and $450.38 in past years. While money is definitely important to its operation, the Food Center frequently runs short of certain items. Right now, if you're looking to contribute next Communion Sunday, consider that DCFC prefers non-glass containers. According to their web site, the currently most-needed foods are canned fruit, tuna or canned chicken, and canned meals like SpaghettiO's, chili or stew. No green beans or corn, please. In 2018, Trinity became a Hunger Action Congregation, and is seeking to become a Certified Hunger Action Congregation. About every other month, Trinity members help out at the Denton Hunger Coalition's Mobile Food Pantry at 1100 Malone. A truck arrives in the early morning from Tarrant Area Foodbank. Volunteers are needed to distribute the groceries, frequently including fresh fruits & vegetables and sometimes dairy. From 9am to 11am on the second Saturday of every month, the Hunger Coalition's volunteers distribute food to some 200 people, which they estimate serves 800 people in the Denton community.